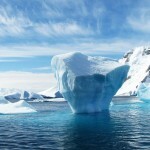 Climate change is considered one of the major challenges of the 21st century. While politicians and scientists at the COP23 climate change conference in Bonn are currently debating the political implications, economists have looked into the various economic consequences of global warming. Three papers co-authored by IZA’s “Environment and Labor Markets” Program Coordinator Olivier Deschenes investigate the impact of rising temperatures on productivity, birth rates and mortality. The authors of the most recent paper, Peng Zhang (Hong Kong Polytechnic University), Olivier Deschenes (UC Santa Barbara & IZA), Kyle C. Meng (UC Santa Barbara), and Junjie Zhang (Duke Kunshan University), analyze detailed production data from a half million Chinese manufacturing plants over 1998-2007 to estimate the effects of temperature on firm-level total factor productivity (TFP), factor inputs, and output. The findings show that both labor- and capital-intensive firms are affected by high temperatures. According to the study, one day with temperature above 90 degrees Fahrenheit (32° C) reduces TFP by 0.56% and manufacturing output by 0.45%, or by $8,160 in 2007 dollars, for the average firm. Since the temperature effects on labor and capital inputs are not as pronounced, TFP losses in response to high temperatures appear to be the primary channel through which temperature alters manufacturing output. Based on historical and projected future climate data, the authors calculate that until the 2040-2059 period, average temperatures in China will increase by 3.6°F (2.0°C). 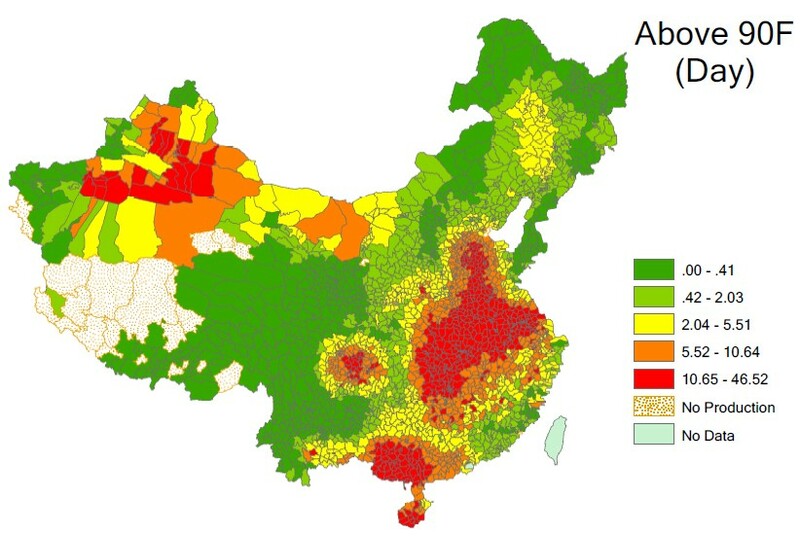 As the map shows, more extremely hot days are to be expected especially in eastern and southern China. For the Chinese economy, this means that climate change could reduce manufacturing output by as much as 12% annually by mid-21st century or by $39.5 billion in 2007 dollars if no adaptations are undertaken. If China’s manufacturing output share remains fixed at 32% of national GDP, those predicted climate-driven losses in manufacturing alone would reduce Chinese GDP by 3.8% annually by mid-century, according to the study. The findings of IZA Discussion Paper No. 9480 show that demography is also affected by global warming. The authors, Alan Barreca (Tulane University & IZA), Olivier Deschenes, and Melanie Guldi (University of Central Florida), conclude that increased temperatures due to climate change may reduce population growth rates over the course of the century. 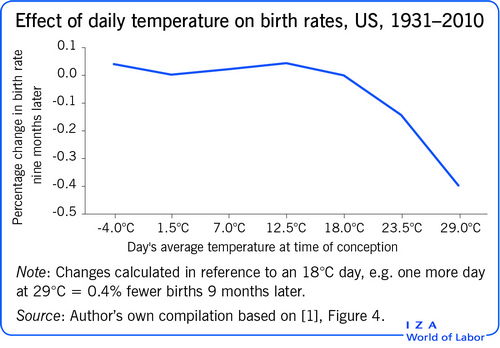 They estimate the effects of temperature shocks on birth rates in the United States between 1931 and 2010 and find that additional days above 80°F (27° C) cause a large decline in birth rates approximately 8 to 10 months later. For more information on this topic, see the IZA World of Labor article by Alan Barreca: Does hot weather affect human fertility? A third paper by Alan Barreca, Karen Clay (Carnegie Mellon University), Olivier Deschenes, Michael Greenstone (University of Chicago), and Joseph S. Shapiro (Yale University) evaluates the relationship between rising temperatures and life expectancy. In the economics literature, hot temperatures have been associated with excess mortality due to cardiovascular, respiratory, and cerebrovascular diseases. The paper shows that the mortality impact of days with a mean temperature above 80° F has declined by about 70% after the 1960s. The results show that the drop in mortality can almost entirely be explained by the adoption of residential air conditioning in the US. In contrast, electrification and access to health care were not significantly related to changes in the temperature-mortality relationship. The authors conclude that existing technologies (such as residential air-conditioning) offer tremendous opportunities to mitigate the impact of climate change. At the same time, greater use of energy-intensive adaptations may speed up the rate of climate change because electricity production worldwide continues to be primarily driven by the combustion of fossil fuels. “The continued expansion of the renewable energy sector and the development of more efficient adaptation technologies should also be key components of the world’s climate change strategy,” says Olivier Deschenes.